Friday 19 September is a distressing day for hundreds of customers of RBTT Bank Grenada, because at 4 pm the financial institution will close its doors for the last time at its St George’s branch. Earlier in the year the Bank announced that it would be closing two of its four branches in Grenada as part of a regional restructuring exercise that will affect its operations not just in Grenada but in all of its Eastern Caribbean operations. The first branch to close its doors was the Grenville branch. The last day of operations for that branch was 15 August, and on 19 September the St George’s branch will close according to a notice displayed. “Clients will continue to have access to ATM, Night Deposit and Safety Deposit Services at our St George’s location,” said a notice on the door at the ATM. The notice also informed clients that the Bank has taken steps to ensure that the process is seamless with minimal inconveniences to its clients. “The economies of the Eastern Caribbean continue to face tough challenges and RBC/RBTT as a committed partner to the region, must be flexible and nimble in its response to the external environment, while continuing to be responsive to our clients’ needs,” explained Isaac Solomon, Managing Director of RBC/RBTT. Since making the announcement about the pending shutdown of the branches, the Bank terminated it relationships with a number of workers who were compensated in accordance with the Collective Agreement of the Technical and Allied Workers Union (TAWU) which is the trade union representing the workers. 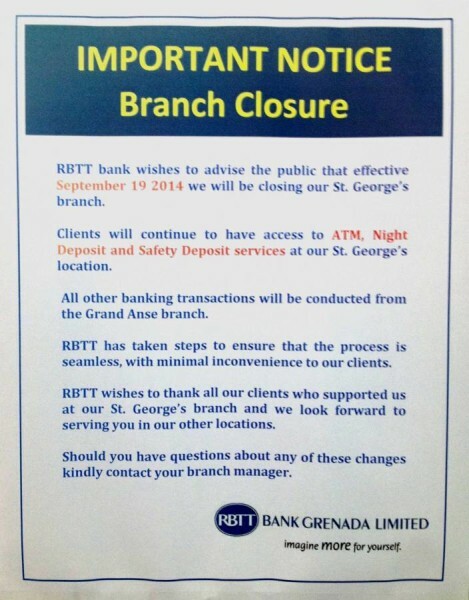 The closure of the branch in St George’s will make RBTT Grenada the first financial institution without a branch in the capital of St George’s. Hundreds of its clients, especially those in St Andrew, are believed to have closed their accounts and transferred their money to banks with branches in that parish. 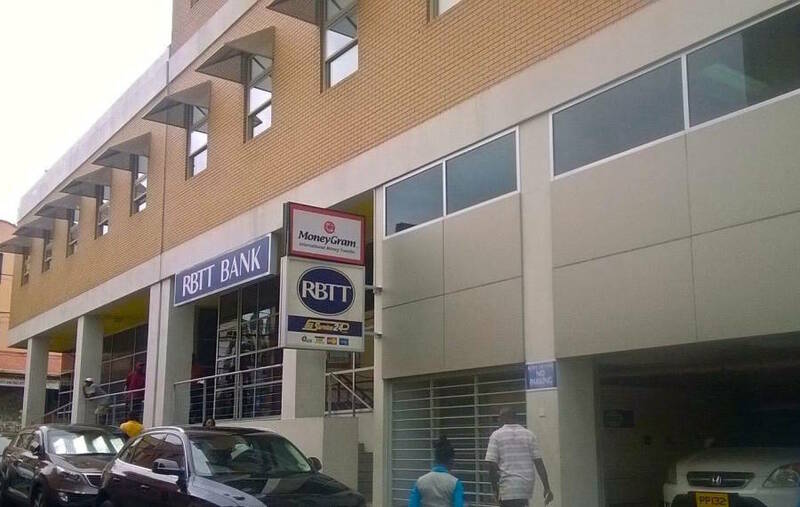 RBTT will only retain a branch on the Grand Anse main road in the area locally referred to as “Wall Street”, and a sub-branch at the St George’s University campus at True Blue. In 2008, RBTT Financial Group (RBTT) which owned RBTT Bank Grenada, was acquired by RBC Financial Caribbean which is part of the Royal Bank of Canada (RBC), the largest financial institution in that North American country.